For this musicologist and author, there are good reasons to believe that Carnatic music matters, perhaps more than ever and almost anywhere in the world. So why not perform and teach it in the service of better education for all, for ecological awareness or in order to promote mutual respect in spite of all our differences? And in the process, get “invigorated and better equipped to tackle the larger issues at hand”. The Sangita Kalanidhi is a happy validation of Sairam’s life and struggles, but “it also entails an important responsibility — to record, document, and share,” she points out. MOUSIKÆ PAIDEIA Music and Education/Musik und Bildung/Musique et Pédagogie. Vol. 1 pb. This book was presented during the 33rd ISME World Conference for Music Education (isme2018.org) on Wednesday 18 July 2018. Schools are generally oriented towards discipline-based programmes and therefore students often accumulate fragmented knowledge, disconnected from real life concerns. The eighteen contributors to this work suggest that music offers a highway to developing a more appropriate integrated education. They present a range of views on Integrated Music Education rooted in various cultural traditions, based on several interdisciplinary models and integrated arts curricula, inspired by psychological concepts and referenced to recent teaching experiments as well as original research. In this innovative book, the reader is invited to go beyond the dichotomy between ‘education in music’ and ‘education through music’, exploring the opportunities put forward by Integrated Music Education thanks to a constant movement from the theoretical roots through a precise description of teaching activities to the benefits for students in terms of integration of knowledge, personal development, and social and cultural belonging. Lastly, there are some new and interesting ideas for training teachers. At the invitation of Christine Urand (Director, Rietberg Montessori School) Ludwig Pesch took the full assembly of teachers on a musical journey across South India: exploring a wealth of rhythmic and melodic motifs suitable for young learners while enabling parents, teachers and care-givers to enjoy music making themselves (even as “lay people”, musically speaking). This event was also an occasion to explore and discuss the scope for actively participating in an intercultural dialogue, something the presenter has long been known for, while paying homage to Maria Montessori (*): be it as contributor to ISME World Conferences or in association with educational and cultural institutions across the entire spectrum: teacher training, kindergarten, schools, rehabilitation just as staff integration programmes; conservatoria and universities in several countries; and creative projects developed in association with the Goethe Institute and exhibition makers at internationally renowned museums. Date: 1 March 2018. Events on similar lines have been developed in conjunction with Museum Rietberg (Zurich) on the occasion of exhibitions of rare Indian art (in collaboration with art education staff). * From 1939 until 1947 Dr. Maria Montessori worked closely with Rukmini Devi, founder of Kalakshetra (est. in 1936 in Adyar/Madras, now part of Chennai), an institution established for the integration of India’s cultural heritage and learning. Kalakshetra stands for an integrated approach to education all realms education – social, economic, crafts and performing arts, being both inspired and guided by India’s first Nobel Laureate Rabindranath Tagore whose pioneering concept for informal learning was first tested and further developed at Santiniketan (“abode of peace”). These pioneering efforts remain as relevant today as in the early 20th century when Maria Montessori and her associates realized that true education is more than a tool for succeeding in life as an individual or member of one’s own society: it is the very key to world peace and social justice (see, for example, her 1932 “Peace and Education” lecture published by the International Bureau of Education, Geneva). With chapters on music and emotions, music as medicine, music and intelligence and much more, Why We Love Music will entertain through to the very last minute. 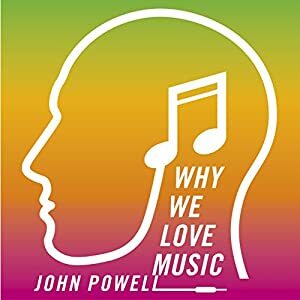 A delightful journey through the psychology and science of music, Why We Love Music is the perfect audiobook for anyone who loves a tune. You are supposed to sing it when you consecrate an altar out of doors. Staal believes such resonating, repeating measures of sound may be older than human language itself. It may have worked like this: Our ancestors chanted rhythmic patterns of sound long before we ever thought that sounds should signify specific things. Sound came before sense, before we had history, back in the time of birds. Language came out of ritual rather than the other way around. Why birds sing : a journey through the mystery of bird song by David Rothenberg. New York: Basic Books, ©2005, p. 185. During this presentation, musical figures from several distinct traditions were explored in a practice-oriented manner. The figures selected are appealing beyond South Asia where they originated many centuries ago and continue to play a key role in classical and applied music. Our shared goal was to enable young and old to collaborate in a memorable learning process that blends seemlessly into any chosen subject, academic and otherwise. The criteria for selecting a particular figure were (1) its flexibility as for combining it with another subject, for instance mathematics, geography or history; (2) its appeal going by prior experience with learners from different age groups; and (3) its scope for variation, movement, visualisation and analysis in accordance with learners’ specific needs and abilities. As part of integrated music education, Indian music enables even complete strangers to share a useful learning process. This calls for a natural and playful approach to melody, rhythm, hand signs and body movement. In this manner we are prepared to include newcomers – children and adults lacking a common language – to instantly participate in music. Indian music is valued for fostering memory, analytical thinking, concentration, and cooperation among peers. Its basic concepts are exhilarating and liberating whether or not there is scope for studying Indian culture in its own right. This is a boon in circumstances where verbal or written instructions fail to engage learners. Rather than resigning in the face of such formidable challenges, educators are free to experiment and spread solidarity through instant inclusion – the essential joy of “creating” music oneself. This aspect addresses a common fear among learners, namely to be left behind (again! ), be it in music or other subjects – a fear that is all too often justified in competitive modern society. To help educators to overcome such fears, we build lessons around simple figures that bind tunes, rhythms and movements together into a rounded whole. Some of these may appear familiar enough to “break the ice” if needed; and others are so fresh and mind-boggling as to trigger further experimentation among peers in informal settings – anywhere and anytime. For this to happen, we dispense with technical resources of any kind. Adaptation is the key to rapidly changing learning scenarios wherein cultural stereotyping, a known stumbling block for educators all over the world, must be overcome. This is easily achieved by integrating Indian music into discussions of academic concepts, or by letting its rhythms enrich social and outdoor activities. Such activities are by definition location specific and all-inclusive. Educators from Canada, Finland, Germany, Hungary, India, Singapore and Switzerland were among the eleven participants in this one-hour session. They explored a time proven method suited to the needs of a wide range of abilities and learning goals; and this irrespective of participants’ cultural roots. *Rabindranath Tagore in a letter to C.F. Andrews; quoted by Amartya Sen in The Argumentative Indian: Writings on Indian History, Culture and Identity. London: Penguin, 2005, p. 86.